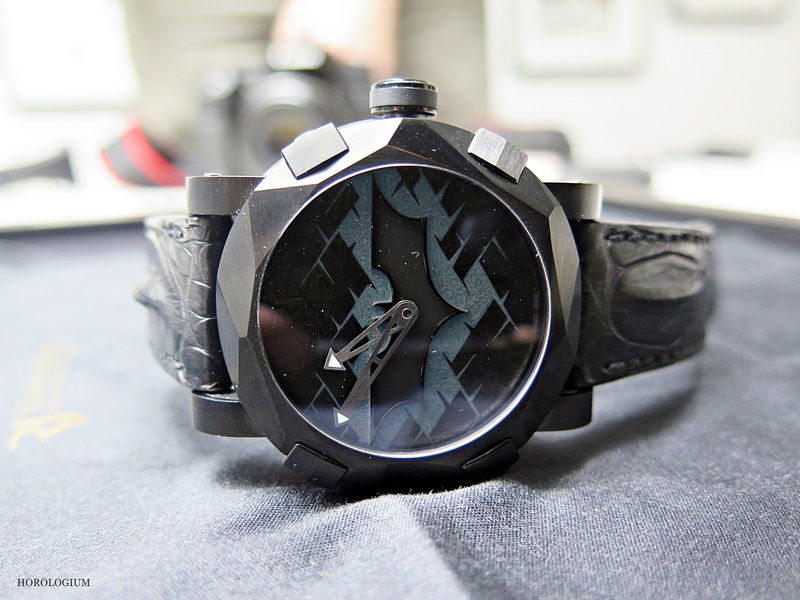 In late 2014 Romain Jerome did a collaboration with Warner Bros. on behalf of DC Entertainment to celebrate the 75th Anniversary of Bob Kane/ DC Comics’ Batman. Earlier this year I had the chance to see it in the bat-metal at the Romain Jerome headquarters in Geneva. The Batman that each of us recognises is in part a product of our age/ era, whether this be in comic, tv or cinematic form. As with other superheroes, he seems to be subject to periodic reinvention and levels of ‘darkness’, but even for those of us who were not of that generation, there is also a fond memory of television repeats of the cult 1960s series with its over the top tongue-in-cheek joyfulness. Perhaps it wasn’t a terribly faithful rendition of the comics, but there’s little doubt that its success lodged itself into popular cultural history. I’m not sure that Adam West ever lived it down, though. In this addition to their ‘Collaborations’ collection, and their first ‘super hero’ watch, RJ-Romain Jerome did not take the Adam West route but the ‘Dark Knight’ one. It might be worth musing about how they may have interpreted the 1960s version…or that could be just me. So it’s all about the darkness in this limited edition is in a 46mm black PVD steel case. Pure stealth, pure Batmobile-inspired. The darkness theme is carried through to the applique Bat Signal which is lacquered but which is lumed up by Super-LumiNova. A case of having to shine a light onto it rather than a light emanating from it, in a manner of (bat) speaking. The ‘rough’ finish of the dial is deliberate, to match the very angular case and the ‘dark’ inspiration. There is a Batman medallion engraved into the caseback which has been similarly ‘roughly’ finished. Movement-wise it contains the Calibre RJ001-A automatic movement with a power reserve of 42 hours. Water resistance is 3ATM (30m). Limited to 75 pieces, it comes on a black hornback strap and RRP is EUR 16,950. Over the last couple of years in particular, I’ve found Romain Jerome an interesting brand to get to know. At first glance when you hear about watches such as this one or the Space Invaders or Pac-Man models you wonder about spending a lot of money on reinvented childhood memories, but when you get to handle them what happens is that you get caught up a bit in said memories, and it becomes about having fun. For those who are interested, click on this link for an intriguing story published yesterday about the man DC Comics decided was the ancestor of the fictional Bruce Wayne.